Consistently voted one of the top Fijian Resorts, Taveuni Island Resort is a small exclusive luxury resort which offer’s the Ultimate Tropical Island Experience. Fiji Luxury at it’s best. Beautiful Taveuni Island Resort has won many prestigious Awards for the excellence to service and commitment to the caring of their guests including; Top Boutique Resort in Fiji, Connoisseurs Choice from Resorts & Great Hotels of the World, One of the Top 100 Places in the World to Visit before You Die! Their pristine white sand beach was chosen for an International Movie and the resort was one of the Top Six Resorts of the Year for an International “Getaway” Travel program. Taveuni Island Resort is the jewel of the Pacific, set on ten acres of immaculate manicured gardens and accommodating 14 privileged couples. There are only twelve accommodations, so each house is positioned for privacy and to take advantage of the spectacular views over the azure ocean and surrounding islands. Taveuni is a verdant paradise for nature lovers and lovers alike. It is home to dense rain forests, over a hundred waterfalls and rivers, world famous dive sites, world class fishing and wonderful cultural experiences. Taveuni Island really is a magical Paradise nestled in tropical Fiji. The resort has 12 luxury ocean view bures and one exclusive oceanfront villa. Each has spectacular views of the Somosomo Straits. 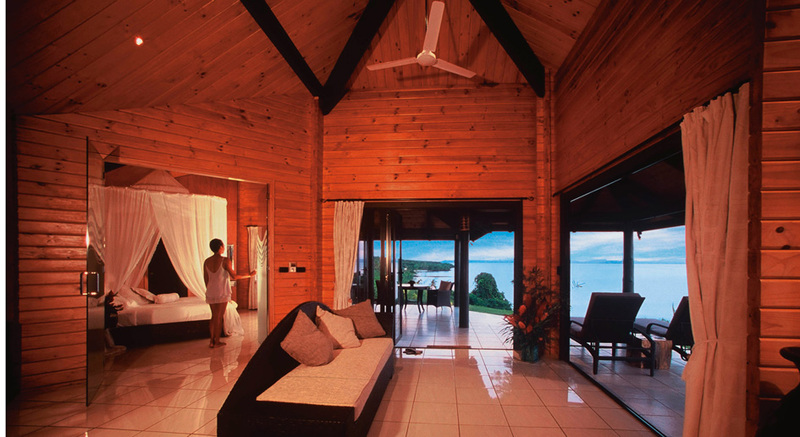 The luxury bures are over 100m2 in size and are built with native Taveuni timbers. There are floor to ceiling windows on all sides. The bures are open plan and the lounge opens into a spacious outdoor living area, which overlooks the ocean and surrounding islands. The décor is tropically inspired – cool tiles, native floral arrangements and watercolor paintings. The bures have king-sized beds and all feature private outdoor showers. They also offer the exclusive Matalau private villa. This private and luxurious villa is complete with a private plunge pool and waterfall, your own personal chef and staff. There is also the option of a butler service. This is an all-inclusive villa, including alcoholic beverages. Their talented chefs take the islands daily bounty and the freshest of local ingredients to create a delight of culinary experiences. In true Fijian style the food is artfully presented and a feast for the senses ~ a food lover’s delight. Local delicacies are showcased in sumptuous Fijian and Indian feasts held weekly. Cocktails and exotic fruit juices are served at sunset. Picnic hampers are available to enjoy while at sea, on sand or exploring. Chefs use organically grown herbs, vegetables salad greens. They make all pastas, mueslis, fruit juices, jams, cookies and chutneys. The cuisine is innovative, fresh and healthy, and most special dietary requirements can be met. Dine privately, and enjoy an intimate romantic dinner for two at the lagoon bure, under the stars by the pool or on the beach with a personal waiter and musician… Or in the privacy of your own luxury bure. Or you may dine in the company of other interesting guests on the alfresco deck with its rich native timbers and ocean views. It is the perfect place for a leisurely breakfast or a sumptuous candlelight dinner with the casual elegance of white linen. Gracious service completes a memorable dining experience. Taveuni Island Resort & Spa is the ultimate romantic hideaway. The exotic setting provides the perfect backdrop to your dream holiday, wedding or honeymoon. Relax on the soft white sand beaches; delight your senses in the sweet fragrance of the gardens; enjoy the view of the ocean from a cliff-top deck; appreciate the tranquility of the cascading waterfalls amidst the lush jungle. These spots are perfect for an intimate picnic, a romantic getaway or as the venue for your dream wedding. Skim in and out of the secluded bays on your kayak and venture into the turquoise waters of the lagoon to snorkel or enjoy an isolated romantic beach lunch of local delicacies. Meet the smiling friendly people who will tell you about their culture and traditions. Dive the world famous White Wall and Rainbow Reef with multi-hued soft corals and fish in such abundance it will take your breath away. Experience game fishing in the Somosomo Straits catching wahu, mahimahi, tuna, walu to take back to the resort. Go trekking in the Bouma World Heritage Park and spot exotic birds and discover hidden waterfalls in one of the world’s last completely undisturbed tropical island rainforest habitats. To complete your day in paradise, relax and be soothed at the resort spa with tropical island treatments. Horseback Riding, Golf & Tennis are also easily arranged for you on arrival. Garden Tours can also be organized. Come and be pampered in our Spa facilities, feast on wonderful innovative cuisine, our caring friendly Fijian staff are here to make your stay unforgettable. Taveuni Island Resort caters to adults only.